I am just completely humbled and grateful for the wonderful weekend that me and my team had this past weekend in Waco, at the JB Quarter Horse futurity and barrel race. I want to give a huge gracious thank you to my horses. Dash ta Jones won the DC finals Friday, placed fourth in the Elite race two, and he was Fourth in the average. I am forever grateful to this horse because he has really helped my riding. He is also so kind to my four yr old niece. Boom Goes the Fame placed in the 1d in Elite race 1, and she barely tipped a barrel to place in the 1d in race 2, which kept her from placing in the average. HP Dash ta Fiesta qualified back into the futurity Championship round, won a little money in Elite race 1, and he was in the top twenty Saturday night in the championship round of the Futurity. Thank you Jason Martin and Charlie Cole for allowing me to be a part of these equine athletes lives. Frenchmans Rockin, owned by Lindsey Sykes Netterville and Matthew Netterville, was one hole out of qualifying for the futurity championship round, however he stepped it up in the Friday night consolations round and placed sixth. Thank you Lindsey and Matthew for allowing me to finish Ricki out. He is such a cool gelding. Jeanette Nelson and I were so proud of NNN Sixums Firewater! She rallied back in the Consolation Futurity race to place third in the futurity, and she ended up placing deep in the 2d in Elite Race 2. Thank you Jeanette for always believing in me and Bunny. Turn N With Ease, aka Sleepy, has been a colt that I could always feel had it, however this fall he started really coming into his own. Thank you Sondra Jefferis Blair for purchasing him from my breeding program, being patient all year, and always believing in me along the way. I was so happy that you were there to experience your equine athlete’s win. Kate Quast, whom I owe a huge thank you too for all her help as an intern, had a great weekend too! Her and her wonderful gelding Banker, placed third in the warm up race, second in race 1, fifth in race two, which secured them the average race win! Congratulations 🎊Kate, and thank you for working so hard! Thank you to all whom was involved putting on this wonderful paying race! I know Tc Long and his crew work endlessly to produce a great show! Sheridan Gates Cummings, Christie Heronema Long.... thank you all! Jody Green, Sierra Emett, Lisa Downs, thank you all for being part of my team, a phone call away, and always willing to help. Thank you Andrea Workman Enzenauer for keeping my horses spa’ed up at the shows, and I will keep your family in my prayers all week as you mourn the death of your cousin. 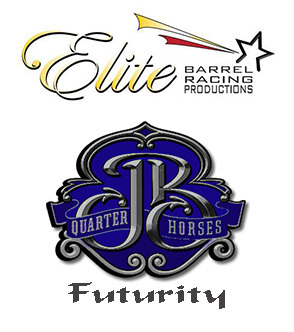 Congratulations to all the JB Futurity Consolation Round Winners. Kelly Bruner and French Zone out of 'R' own broodmare Star Zone turned in a 14.887 good for second place. NNN Sixums Firewater was 3rd and Frenchmans Rockin was 6th. Congratualtions to Melinda Edwards Dunn and Tres Ducks in a Row placing fourth in the warm up race! So happy she found such a great home! Thank you for allowing me to still be part of her life!